The XXXIII International Fair of Havana (FIHAV) held between November 2nd and 7th meant for Cuba Ron SA the opportunity to present new products. Isla del Tesoro Rum, another jewel from the ancient and famous aging wineries of the Rum Factory of Santiago, city where Light Rum was born to Cuba and for the whole Globe in 1862. It was first introduced to the world with commercial purposes in the Food Fair in Barcelona, Spain, held from March 31 to April 3, 2014. This new flagship of the Cuba Ron Corporation SA will be distributed throughout Spain by the prestigious Bodegas Torres, established in Vila Franca del Penedés, in the region of Catalonia, which has organized a meticulous plan to introduce this unique product. Among the different actions performed we found different tastings commented by the Master of Cuban Rum Tranquilino Plasencia, who introduced Isla del Tesoro rum to managers, vendors and major customers of Bodegas Torres in different regions of Spain. The Cuban expert gave a detailed explanation of the socio-cultural elements which, together with its extraordinary quality, make Isla del Tesoro something very different from what is known so far in the market, also covered in the original ceramic bottle and its majestic wood case. 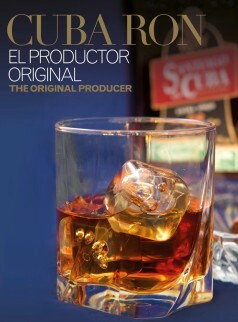 Also, different interviews with important specialized media, such as the ones the Master of the Cuban Rum Tranquilino Plascencia gave the known Magazine Epicure and the Digital Magazine Los Caminos de Baco, in which he talked about the characteristics of the new Cuban Light Rum, named Isla del Tesoro, as well as aspects related to the work and professionalism of the Masters of Cuban Rum, faithful and true defenders of the "Cuban rum culture". Bodegas Torres also awarded a very prominent place to the presentation of the new product within the activities scheduled in their visited and huge stand, located geographically in the heart of the pavilion where the wines and spirits from around the world were presented. Unique, exclusive and novel, reminiscent of the legends of corsairs and pirates who buried their treasures on the islands that surround Cuba, Isla de Pinos, renamed Isla de la Juventud. This is the new jewel of Cuban Light Rum by the Cuba Ron Corporation SA under the suggestive name of Isla del Tesoro. The new Isla del Tesoro rum is entirely handmade, not only in the work of the Aged mixtures specially prepared by Masters of Rum, but also because of the bottle that is specially manufactured by craftsmen, and comes in boxes specially created for it, reminiscent of the old treasured privateers and pirates´ chests. With a bouquet reminiscent of sugar cane eau-de-vie, result of very aged mixtures, its aroma and exquisite flavor give us hints of chocolate, coffee and vanilla. Isla del Tesoro is an Ultra-Premium rum, fruit of the joint work of the Masters of Rum from Santiago de Cuba, and will have a very limited production. Although as a brand it has over forty years, it wasn´t till now that It was decided to market it commercially, since for long time it was given away as a gift by the Cuban Government to high dignitaries and personalities.